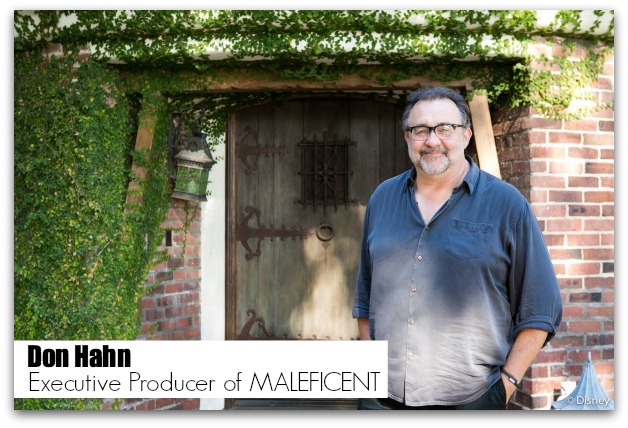 As part of my trip to LA last month to celebrate the upcoming release of MALEFICENT to Blu-Ray and DVD I had the rare, awesome and exciting opportunity to sit down and chat with Don Hahn about his role in creating this film as Executive Producer. I have said it many times, but MALEFICENT is one of my all time favorites, I adore this film, and as you will see, Don is so passionate about it and the cast and the characters that it is no surprise that this film turned out so fabulous. I think that this interview, and his answers, turned into one of my very favorite interviews just because it was so neat to hear that true passion that he has for his work, and he was so open and warm about sharing his insights and feelings about this film. DH: It is always trying to pull all the pieces together and a lot of it is just calendar work, as simple as that sounds. But once we had all the elements together in the script, and wanted to make the project, we had four months to prepare. And that was four months to build a whole world. A lot of the credit for that goes with our director Robert Stromberg who had production designed Avatar and Tim Burton’s Alice in Wonderland. So he is an amazing world builder. That was incredibly difficult. Because we only had three months with Angelina and it was a very tight fit in that three month time. So that was part of it, getting it together. And then also just the script because it is a iterative process where you’re re-inventing the story and going back and revisiting it again. It is a little bit of an insecure feeling. The build up to shooting is always the hardest part. DH: We had three months with Angelina We shot for eighty-five days. So a slight bit longer because when she left we still had Elle Fanning, we still had some other pick-up shots along the way. And then we had about a year and a half of special effects and putting it all together. Because if you were to visit the set it was a couple of trees and a river and a lot of green screen behind it. So it was a world almost entirely created with back paintings and computer graphics. The only things we built were the throne room, and the area where the dragon gets unleashed at the end was a complete set built all the way around. The exterior battle scenes were filmed right between Pine Wood and the M- M-4, M-5 freeway. So if you were to turn the camera while the battle scenes were happening? You’d see like a freeway going behind! But a lot of the castles and things were added in using computer graphics later. It was like so gettable. And that’s a lot of the fight when you’re trying to get a movie off the ground. And she brought a lot to it, I have to say. She was even on it before the director. The first director that we had for a short time was Tim Burton and she was already on it even then. Then, the amazing Linda Woolverton who wrote our screenplay. I had worked with her on Beauty and the Beast ages ago. And Linda’s, she’s really extraordinary when it comes to writing these stories and creating these strong, particularly female characters, that have these strong relationships. Because we wanted to break some rules in this movie to say that love doesn’t always have to come from the guy in your life…that love conquers all is a bigger phrase. That it can be love between two women, two men, a godmother character and a childlike character, like Aurora and Maleficent. And she fearlessly attacked all those things and I think did a great job with it. There were some days when I thought, what are we doing? We’re messing with this Disney fairy tale. But you also knew we couldn’t tell the other story. We couldn’t say you’re a young woman, you’re gonna be asleep until a man comes into your life and tells you it’s okay to wake up? And then you can start living your life? That’s an awful story to tell in 2014. So, it didn’t take too much smarts to abandon that and do something that’s more relevant. DH: Yes. And I think also for clarity, just for the audience. So that it’s clear, you know that she’s always one character name. But yes, we wanted to simplify it and we wanted to get away from the idea that she was the sacrificial flower that someday would be opened up by a man. I mean those are all great if you’re in 1959, but it just didn’t seem appropriate for this movie. Q : Was it always the plan to use Angelina’s daughter as the baby for Aurora? DH: No, that was out of necessity because when we brought in little girls and dressed them up like little Aurora,they would come up to this amazing actress and scream and run away. There’s so much genuine love and attachment in that scene where she just walks right up to her and goes, “Up” and you know, I have a little girl and, and you just know what that feels like. So there’s a real genuine moment in that scene. Q: I heard Walt Disney had a hard time trying to create Maleficent as being both beautiful and powerful at the same time. Q: Did you have that same issue when trying to transform Angelina for the part? DH: The problem is that with most fairy tales, the villains are very black and white. They’re often the most interesting characters in movies because they have a lot of complexity to them. A character like Maleficent was at least interesting in her beauty, and in her look, and the way she behaved. I think what our problem was is how do you then open that character up to show that there’s a heart inside? Because you couldn’t just go out to the press the day before the film is released and say, “You know this awful villain? She’s really nice.” No, that ruins it all. She’s still Maleficent. She still has a very complex view of life and she still has a lot of challenges, but there’s enough of a light inside that she can open up enough to show that she has some benevolence and some love inside. So, it took a long time. And I have to say, Angelina gave us most all of that, because she has a very restrained performance where she only shows you a little bit of that at a time. So she’s opening up to the baby Aurora or the little kid Aurora and she shows that she has something inside, but not until she actually says, “I’m sorry I cursed the wrong person,” and kisses her on the forehead. You go, wow, this is a far more complex, evil person than we’ve ever dealt with, at least in a Disney movie. And I think that’s what was interesting about making this movie is that it wasn’t just a bad guy. You know whether it’s Ursula the sea witch or Scar or something like that? They’re just bad. And they’re clever and they’re cunning, but they’re bad. Maleficent couldn’t just be bad. You had to show that there was some reason why she got wounded and her wings were clipped and what that meant to her and how horrific an experience that was. And so that was part and parcel of telling that story. Q: Were you a fan of the Wicked story and the Broadway musical before you started working on MALEFICENT? DH : I was. Yes. For me it was an easy way to explain to people what we were doing. To say, “We’re gonna flip the story and investigate this character instead of that character.” So instead of doing Sleeping Beauty again, let’s go investigate the life of Maleficent. And people could understand that really quickly. It’s hard, there’s so much noise in Hollywood and when you’re trying to sell movies or just the idea of a movie? It was a quick way to communicate it more than anything. Q : Did you make Maleficent’s wings or were they special effects? DH : They’re all fake. They are. There’s nothing there that’s real. If you were to watch the dailies of her being filmed, she had a little green square on her back which held a battery and two little antennae that came out with bright orange spots on the end. And that was enough for the visual effects guys to know the symmetry of her back. And that’s all. And so everything you see in terms of her when she’s flying, most the time it’s a hundred percent animated. So to do this, we take a scan. You literally put her in a drum and do a drum scan of her and so you have that. Rick Baker did a face cast with plaster of her head so we could get the horns, because the horns had to feel like they grew out of her skull. They were magnetic so if she caught her head by accident on something, they would break off for safety reasons. So it was a really unusual film in terms of preparing it because there were a lot of question marks. But yes, so much of it is animated or fabricated. And the wings are all animated. Q: They did a great job. Q: On the bonus clips, we see a tiny set with a green screen. It looked like the actress couldn’t move a whole lot, which had to be difficult. DH: I think it’s remarkable because they had their costumes but you would argue that so much of a performance comes from feeling like you’re in the time period and in the zone with that space. And there’s nothing there. The sets were smaller than this backyard in many cases. Can you imagine what Elle Fanning felt? Like she’s fourteen. She gets hired under a movie with Angelina Jolie and she has to show up on the set and play opposite her and remember her lines and there’s no set. With a green screen. And “Action.” You know and so you just go, wow, what a remarkable actress she is. Beause she really delivers a lot of warmth to this movie. Q: I guess it’s very similar to the voice actors in an animated movie. Like Beauty and the Beast is one of my favorite movies. DH: Yea! Thank you. There is a lot of Beauty in this movie, not only Linda and I who worked on the original film, but just a lot of the thematics of it. And we were big, even twenty years ago, fans of not wanting to make the princess just be a victim or somebody who was just along for the ride in the story? And someday when the guys work things out, I’ll have a happy life, you know. It’s like, no. You know I have a little girl who was born the year that Beauty and the Beast came out. And I guess maybe I was over-aware of it. And so did Linda. I mean we both have girls are the same age. Now my daughter is twenty-two or twenty-three. But it’s still like no, let’s talk about like real life. And what I was telling my daughter and what my wife was telling my daughter was that you have to have your own identity. You have to be yourself. And yes, you’ll fall in love someday, but that doesn’t have to be now, it can be later. And we wanted to give those attributes to our characters. Q: Bella is a favorite character to many children, thoughts? DH: Aw, that’s sweet. In the original fairy tale, Belle was given away as a piece of property almost because her father got trapped by the Beast and he said, “Well you know I’m worthless to you. Take my daughter. I’ll send for her.” And Belle shows up at the castle and says, “Okay, Belle, thanks. Bye. I’ll be back at the wharf.” And, she really is like a, a piece of meat that’s along for the ride. And so I mean we can’t tell that story. It’s awful. So that’s when Linda said, “Let’s make her bookish. Let’s make her turn into” and Howard Ashman as well, the songwriter, “Let’s make her want her adventure. Let’s make her like read books and her head’s in the sky and then she gets her adventure in a really unexpected way.” And it’s not until the very last scene that she finally sees that there might be more here than just a big hairy guy. Q: I can’t see Maleficent without Angelina Jolie. DH: She’s remarkable too because she channels and studies great actresses of the past. So she’ll look at Barbara Stanwyck and she’ll look at Bette Davis and there’s moments when she’ll say a line and you just see that. So she has a classic quality to her and I think in lesser hands it could have been much broader and much more cartoony? And she just is so restrained and appropriate in how she plays that role. I just can’t imagine how difficult that was. Q: She says so much without saying anything. DH: She has very little dialogue for that character. I remember when she was preparing, she said her acting teaching was having her reach into soil and feel it because she’s part of the fairy world and that’s where the fairies come from. And the sense of land and all of that was very much a part of who she was. I thought, wow, you know the level of preparation. An amazing, amazing lady. Q: It broke my heart when she woke up and her wings are gone. DH: Yes. In the script, it was heartbreaking. When those scenes came in the dailies? It was devastating. I mean because of that cry, and because of what she did. Because in the script you go, “Oh, they clipped her wings.” You know it’s like Icarus, she lost her wings. She can’t fly anymore. And you go, “Oh, that’s too bad.” When she performs it, it becomes this very deeply felt, very deeply felt thing even for me. And my wife said that for her it was almost like she couldn’t watch, it was really devastating. But that’s again a great actress doing what she does. You just feel the depth of that loss you know. Q: I thought it was fitting that Aurora saves Maleficent’s wings, thus saving her. DH: Yes. It was. Aurora was a tough character because her mother’s gone and when she gets back to the castle, there’s no maternal character for her. And we killed off her mom for a very specific reason, so that her relationship had to be with Maleficent. And Dad’s a cold fish. You know he doesn’t even hug her when she comes to the castle. So now the only family she has is Maleficent. And so the icing on the cake then is for her to free the wings, which is kind of a symbol for her saying, “You have your freedom back. You can fly again because of your love,” you know. And that’s the kind of symbolism in story telling is really powerful. And it’s fun to do and if it works? It’s deeply felt, which makes it fun to do. Q: Something I live by is that everything happens for a reason. I thought Maleficent played into that, especially with her wings being stolen and how that affects her relationship with Aurora. DH: Yes. We’ve all been dealt bad hands in our life and a lot of times we’re judged or grow up by how we deal with that. There’s every reason for her to be angry and bitter by what’s happened to her. But over the course of the story she’s able to leave that behind and realize that it’s the love she has for Aurora that kind of triumphs over all the nasty things that have happened to her. And that’s life. I made a documentary a couple years ago about veterans returning from Afghanistan and Iraq and, and they are kind of the same thing. They’re wounded. They’re missing limbs. They’re missing their heart. They’re missing whatever. And they live or die depending on how they deal with that. And in a way that was what Maleficent was. 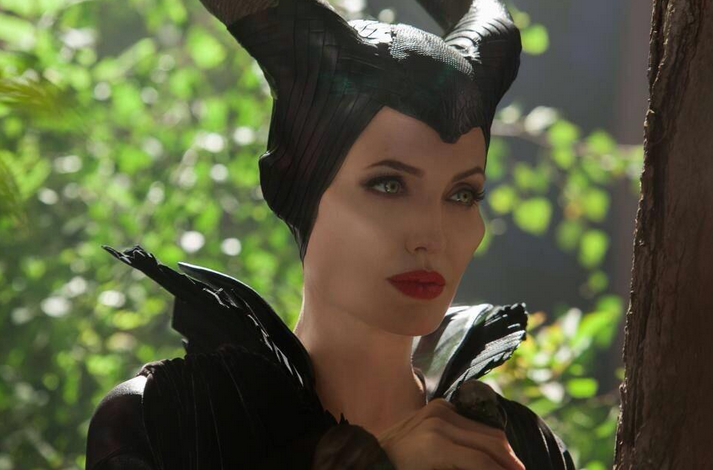 Maleficent will hit the shelves on Blu-ray on November 4th, 2014. 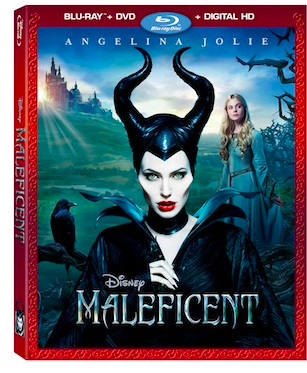 You can pre-order the Maleficent DVD on Amazon right now for $19.94. I can honestly say that this film is in my top 10 of all times, possibly top 5. I adore this movie and it is one that I can watch over and over again. About: Academy Award®-Winner Angelina Jolie transforms into one of Disney’s greatest villains in MALEFICENT,coming to Disney Blu-ray™ Combo Pack, Digital HD, Disney Movies Anywhere, DVD and On-Demand November 4th! This wickedly fun twist on the classic “Sleeping Beauty” comes with spellbinding bonus features including: deleted scenes, “Building An Epic Battle,” the meticulous detail that went into creating Maleficent‘s elaborate head wraps in “Classic Couture” and more! You can read my full review of Maleficent here. Remember, Maleficent is rated PG and will is available on Blu-ray and DVD on NOW! You can order the Maleficent DVD on Amazon right now for $19.94. If you haven’t already, make sure to read my interview with Angelina Jolie (Maleficent), my interview with Elle Fanning (Princess Aurora) my interview with Sharlto Copley (King Stefan), my interview with Maleficent director Robert Stromberg, and make sure to follow @Maleficent on Twitter for the latest updates, and make sure to like MALEFICENT on Facebook so that you can keep up with all of the Maleficent excitement!